Canvas zipper bag for travel, cosmetics, or whatever suits your fancy; 11" x 7" x 3", zipper with tassel pull. Tye-dye design in hot pink; Authentically beautiful referencing I Peter 3:4. Metallic accents. 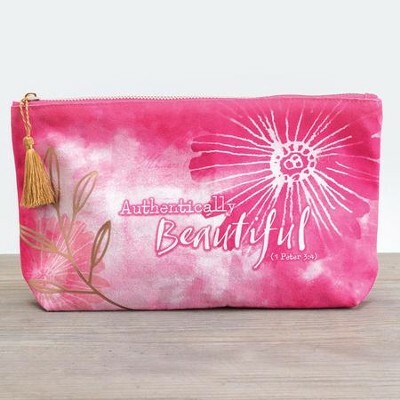 I'm the author/artist and I want to review Authentically Beautiful Cosmetic Bag.